This antigravity workout isn't for the faint of heart. But, if you're ready to take your training to the next level, why not get there by taking the stairs? Just because they don't happen in a gym doesn't mean bleacher workouts aren't serious training. On the contrary, even some of the toughest athletes find themselves sucking wind when training on stadium stairs. That's not too surprising, given that you're not just running, jumping, and doing bodyweight exercises—you're doing them while hauling your entire body weight upward against gravity. It's a brutal endeavor, and even a little bit goes a long way. In fact, a 2017 study by researchers from McMaster University found that just three, 10-minute sessions of stair climbing per week was enough to dramatically improve cardiorespiratory fitness among previously sedentary people. And they only had to do a total of 60 seconds of all-out effort per session! Think about that: just 3 minutes of all-out work a week produced results. But you're not a sedentary person, so don't expect to get let off that easily. You need—and deserve—a bigger challenge. With warmer weather on its way, it's time to find your nearest set of bleachers and get to work. Snake runs are pretty straightforward. Simply run all the way up a set of stairs on the bleachers, jog across the top row to the next set of steps, then walk or jog down the stairs. When you hit the bottom, jog across the bottom of the bleachers to the next set of steps, and continue snaking your way up and down each set of steps as you come to them. Feel free to do this warmup at your own pace. You may want to start walking, then work your way up to an easy jog. Take the steps one at a time up and down the stairs for 5 min. Take the steps two at a time up and down the stairs for 3 min. This circuit starts with basic bodyweight moves, then kicks things up a notch with a tough plyometric step-hopping finisher. Circuit: Repeat twice with no rest. Rest 2 min., then move to second circuit. Broad-hop-broad: Stand facing the bleacher stairs, with your core tight and your knees slightly bent. Swing your arms behind you, bending your knees and pressing your hips back to "load your spring." Jump up and forward as far as you can, executing a broad jump up at least one step. After landing, hop with both feet onto the next step. Then, load your spring again and perform another broad jump. Continue alternating between a broad jump and a hop until you reach the top of the stairs. Walk down the steps, and repeat two more times. The second circuit starts with stair climbing work, then adds a bodyweight exercise between each climb. Aside from torching your lungs, your quads will be screaming. Circuit: Repeat twice with no rest. Rest 2 min., then move to third station. Lateral climb low squat: Stand with your right side facing the bleacher stairs. Press your hips back and drop into a squat with your thighs parallel to the ground. Take a lateral step up the bleachers with your right foot, follow with your left foot. Continue, stepping laterally while holding a low squat all the way up the steps. When you reach the top, reverse the movement and climb back down the steps, leading with your left foot on the descent. 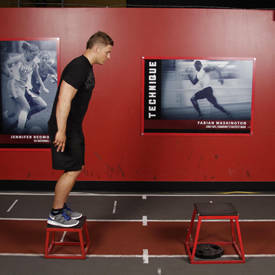 Your third station pairs two tough plyo drills. The good news is that this is a quick station, and you'll be done in under 5 minutes. The bad news? They'll be slow minutes. Superset: 2 sets with little to no rest. Then proceed immediately to finale. Squat jack climb: Stand facing the bleacher stairs, your feet slightly wider than shoulder-width apart. Squat down, pressing your hips back and bending your knees as you swing your arms behind you to "load your spring." Jump up into the air, swinging your arms forward while you bring your legs together. Land on the first step with your feet together. Immediately squat down again as you swing your arms back to prepare for another jump. This time, when you jump into the air, spread your legs and land with your feet roughly shoulder-width apart. Continue jumping up all the stairs, alternating between a wide and a narrow stance upon landing. Walk down the bleachers after reaching the top. Bleacher jump burpee: Stand facing the bottom bleacher. Make sure you have enough room to perform a push-up with your body perpendicular to the steps. Squat down, place your hands on the ground under your shoulders, and hop your feet back into a full plank position. Perform a push-up, then hop your feet back to their starting position so you're crouched. Immediately spring up into the air, drawing your knees high so you can land on the seat of the bottom bleacher (or the bottom step if the bleacher seat is too high). Stand up, and step down carefully. The finale is simple: Just finish up with 5 minutes of snake runs, like you did during the warmup. It's up to you whether you take the stairs one or two at a time, and you're in charge of setting the pace. Walk it or jog it, all that matters is that you finish it. Once you're done, the walk to your car or house will seem like a journey in and of itself. Pop this routine into your schedule once a week during the summer months, and your legs and lungs will be ready for anything else you throw at them. Allison, M. K., Baglole, J. H., Martin, B. J., Macinnis, M. J., Gurd, B. J., & Gibala, M. J. (2017). Brief Intense Stair Climbing Improves Cardiorespiratory Fitness. Medicine and Science in Sports and Exercise, 49(2), 298-307.